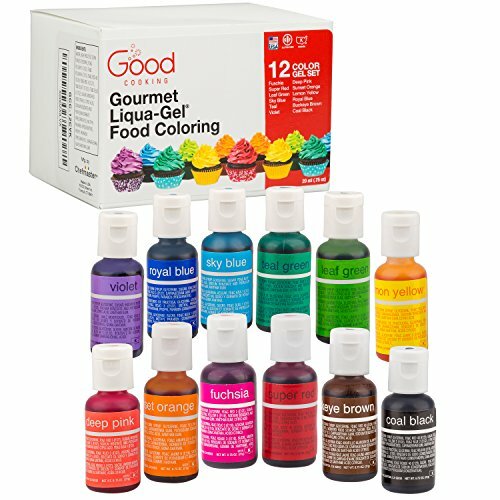 We are currently in the process of completing a whole slew of simple science experiments that you can do at home. 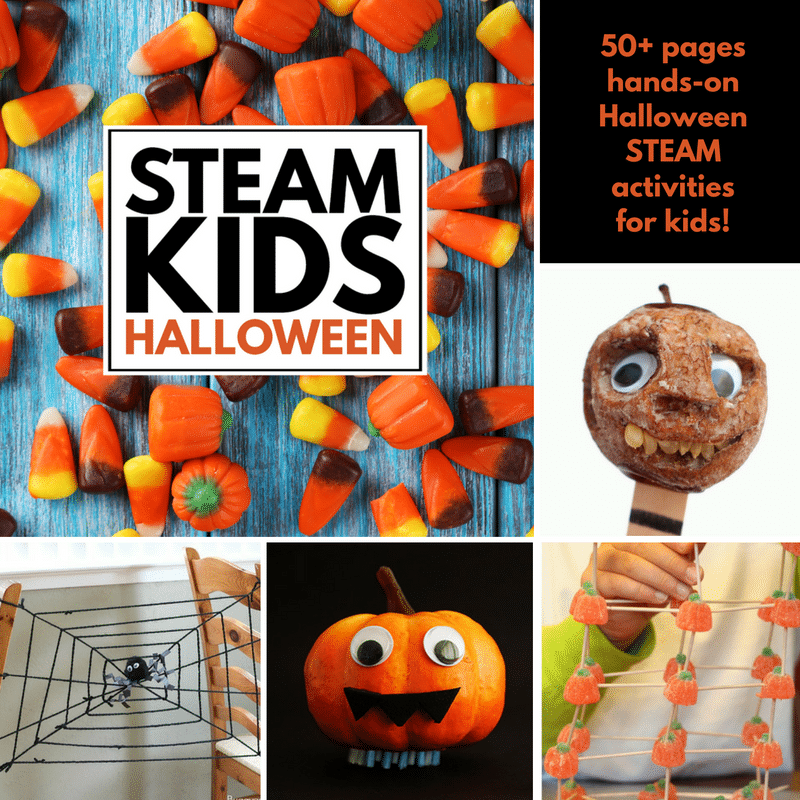 These experiments make the perfect base for science experiments for kids, science fairs, and even Halloween STEM activities. 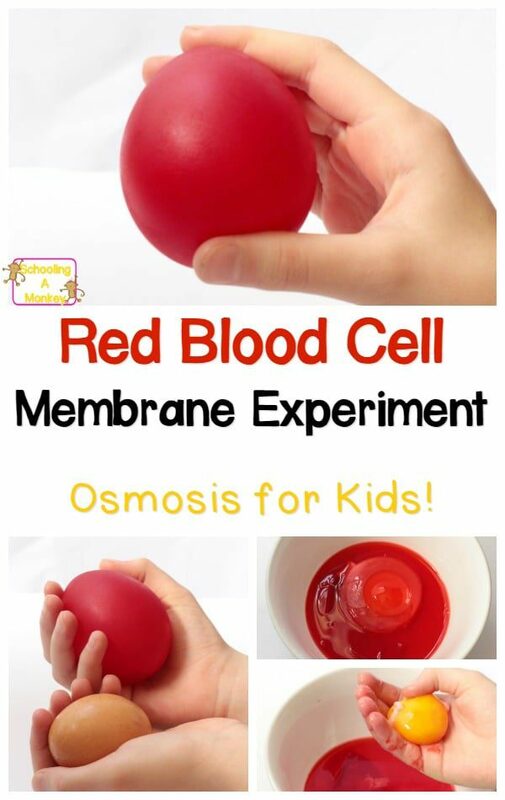 This osmosis for kids experiment is no exception. The best part about this science experiment is that you can do it at home with items you already have in the house! 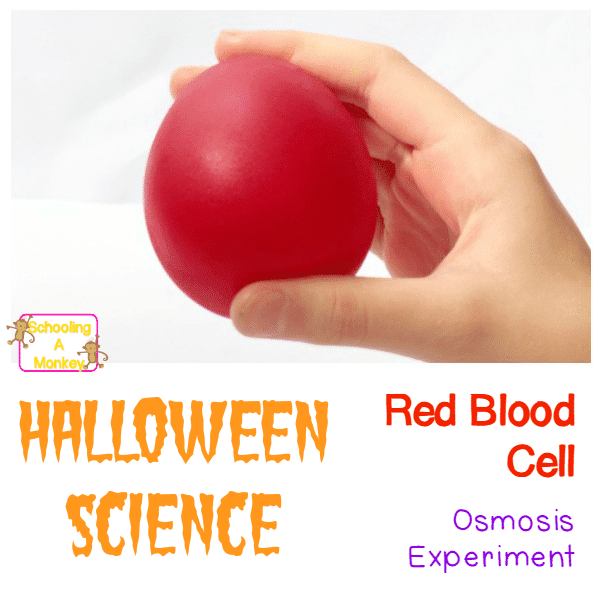 The inspiration behind this osmosis for kids experiment is a mix between the classic naked egg experiment and how red blood cells work. We wanted to try something “blood” themed for Halloween, and this was the perfect way to do it! This twist on the classic naked egg science experiment illustrates the concept of osmosis in a fun and surprising way for kids. Osmosis for kids has never been easier to explain. The inside membrane of an egg is a semi-permeable membrane. The inside of the egg has a lower water concentration than the container, so over time, the membrane of the egg allows water to seep into the egg. This makes the egg much bigger. The membrane is made partially of keratin protein, which is also found in human hair. 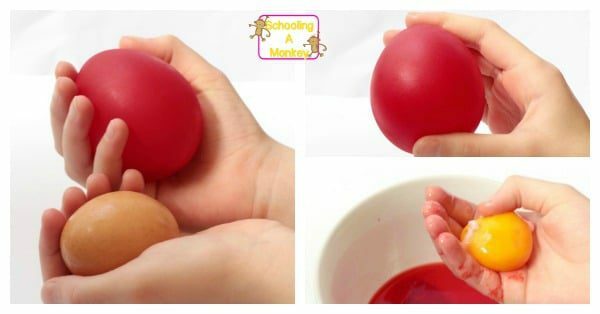 At first, children will likely think that the egg’s membrane is solid, but the soaking the egg in the red water will show that the membrane is semi-permeable, but strong enough to hold the water once it is removed from the container. Monkey hypothesized that the molecules of the yolk were “full” and could not accept any additional chemical bonds which prevented the water from entering the yolk. Thanks to a reader, we now know that the proteins in the yolk are impermeable, so the dye cannot get through! So Monkey was close. Follow along with these directions to make your own osmosis science demonstration using an egg! This part of the experiment follows the basic instructions for the naked egg science experiment. First, soak your raw egg in about 2 cups of vinegar for about 24 to 48 hours. The vinegar will dissolve the egg shell because the acid reacts with calcium carbonate that makes up an egg’s shell. This produces carbon dioxide, calcium, and water. 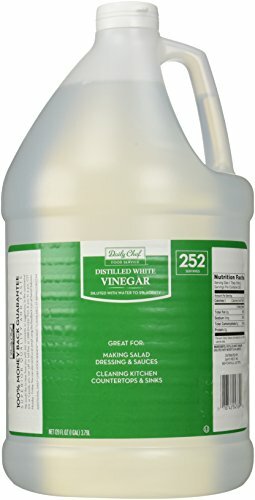 When the surface of the vinegar is scummy and bubbly, you are ready to start phase two. 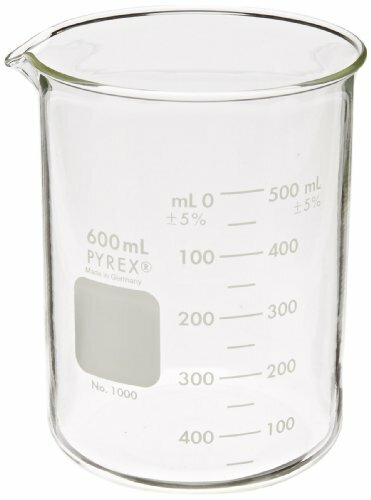 Fill a large container about halfway full with water. Add red food coloring to turn the water red. 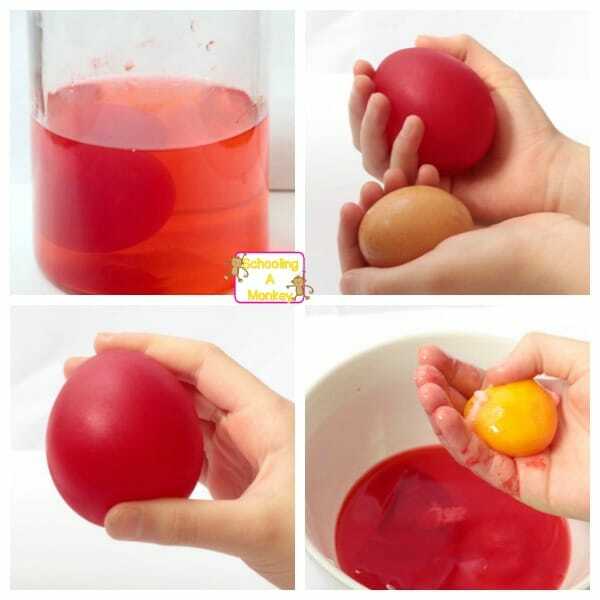 Carefully move your naked egg into the red water. Let the egg sit for about 24 hours. Remove the egg from the water. It should now be a bright red, but completely egg shaped. If you dry the egg with a paper towel, you can see that it is completely dry and will not leak. How does this work? It is all about osmosis! Popping the egg will reveal that the inside white of the egg has turned red, but the yolk has remained orange. Although the membrane surrounding the egg yolk and white can soak up water, the yolk itself does not.